When Darwin originally developed his hypothesis of descent with modification, he used a short list of basic evolutionary principles to explain how it worked. These principles are helpful in understanding how organisms can change over time to becomes distinct species. Below I have outlined Darwin’s original principles, as well as a number of principles I have used to help guide my own thinking about the theory. If you come from a religious background, or have simply never spent much time considering the theory of evolution, understanding these principles can help you overcome the mental constructs or doubts that may be causing difficulty in understanding the process of evolution. Below are the evolutionary principles that Charles Darwin originally outlined in his scientifically groundbreaking book The Origin of Species. Competition: Within each generation, species produce more individuals than can survive within their given environment. Individuals must then compete within their own species for natural resources, survival, and the chance to pass on their genes. This competition results in the survival of the fittest. Phenotypic Variation/Heritable Differences: Heritable, genetic differences can be found within the individuals of each species. These differences manifest themselves as both visible and invisible traits and create advantages or disadvantages for the individual. From the perspective of a species, variation is preferred and necessary, as it provides a higher chance of survival for that species. Descent with Modification/Phylogenesis: The reproductive isolation of groups within a species leads to the diversion of genetic characteristics, which allows new species to emerge from a common ancestor. The line of descent from one common ancestor to the various species that have arisen is known as the Phylogenetic tree. Darwin sums it all up on in the below paragraph. 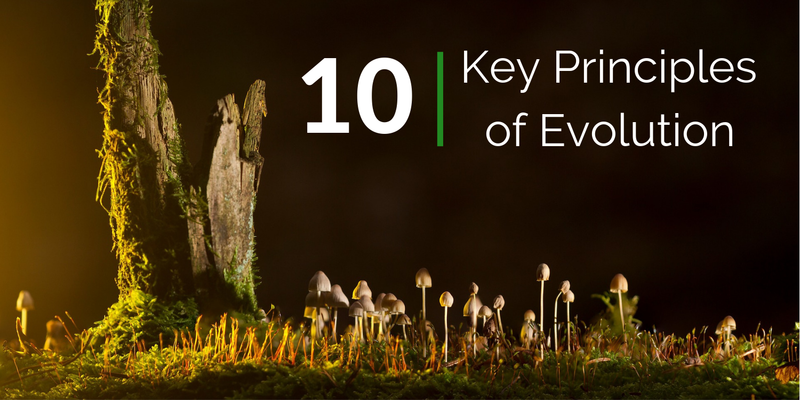 In addition to the principles laid out by Darwin, there are a number of other principles that I have come across and that help me understand how evolution has and is taking place. Below I use my own words to explain these principles, yet I do not take credit for them. I have learned all I know about evolution from the work of others, and, as always, I offer my own disclaimer for the work I have produced. I sincerely hope that these principles can also help you understand evolution and thus yourself and your world. This is a big one, so lets start here. Most every religious dogma provides for the idea that some intelligence or living being designed, created, and guides the universe in a state of consistent equilibrium. This belief provides a wealth of emotional support for those who ponder difficult, existential questions such as how life is possible and what the purpose of existence might be. However, to fully understand evolution it is necessary to let go of the idea of design, purpose, and intelligent influence. When you are able to let go of these constructs many things come into focus — such as the flaws in our own biology and psychology, the genetic connections we have with other species, the power religion and nationalism have over us, and the mass extinctions to life that have taken place over time. Understanding the lack of design in the universe also opens us up to understand the additional principles I have layed out below. As I’ve just explained, evolution is not based on design. It has no agenda and no end goal. Species simply move forward in relation to their changing environments. As humans we tend to see ourselves as the pinnacle of existence, the perfect species for which the Earth and the Universe were created. We may sit at the top from an intellectual and even food chain perspective, yet this in no way indicates that we are the center of the universe. Nor that we have achieved perfection as a species. Nor that we are the pinnacle of evolution. There is no perfection, there is no pinnacle. The best evolution can produce is forward movement. This means that evolution can never go back to fix mistakes. Any weakness in genetic programming that we inherited from our ancestors moves forward with and beyond us. This is in stark contrast to the technology we produce as humans. In intelligent design, such as can be seen in our phones, cars, and medicines, mistakes or weaknesses can be removed and improved upon. Evolution is not making conscious decisions, so it cannot go back and start over. Weaknesses in design, as long as they are not detrimental to survival, will always be with us. Building upon the the two previous principles, this principle helps us to see how the process of Natural Selection takes place just a bit clearer. I came across the phrase “survival of the good enough” in a book by the popular television character Bill Nye, in his book Undeniable: Evolution and the Science of Creation. What this principle means is that again, perfection is not required for survival and is thus not the end goal of evolution. Species do not require the advancement of every single characteristic to survive. We have yet to discover a species that is evolved to survive each and every situation. In order to survive, individuals within a species must only possess enough advantages characteristics to survive long enough to pass on their genes. When we refer to “survival of the fittest”, we should understand that fittest really means “best adapted” and not “perfectly adapted”. Our genes can be thought of as a sequence of codes that determine the traits we possess. Thus, every visible characteristic of humans, plants, and animals is based on the DNA sequence found in the nucleus of the cells. This is the level at which evolutionary change occurs. If an individual is to have the advantage of being bigger, faster, stronger, or smarter it will be the genes of that individual that determines this advantage. When a change takes place within a species, it is due to changes in the gene sequence of the individual. Thus, we do not see radical changes within the evolutionary process. Often times mutations take place within the DNA of an individual. Whether these mutations are beneficial or detrimental they will be passed on to the individuals offspring. Over time, seemingly small mutations can change the traits of an entire species, or even lead to the descent of a new species within a genus. The small changes that take place at the genetic level are simple, but over time these simple changes can lead to more complex organic structures. These complex results take time (see the next principle), yet when we take the time to dwell upon them, the possible path of change reveals itself. We see this same process take place in the world of technology, only at a much more rapid pace. Think about a car and all of the small iterations that have taken place over time to allow us to produce the amazing vehicles we have today. These vehicles are the result of small discoveries and tweaks over time. Evolution is a similar process of trial and error, only it happens independent of a guide or desired outcome. And again, evolution can not go back and scrap an old design for a new one. To arrive at the world we see today, with its biodiversity and ecological diversity, the process of evolution needed a lot of time — nearly 3.6 billion years. Our Homo sapiens brains are programmed to focus on matters of immediacy. What will we eat today? Where will we sleep tonight? What dangers do we need to watch out for in our immediate environment? Thus, the deep time that has been required for evolution is incomprehensible to the human brain. The average life span of a modern American is roughly 79 years. This amount of time from an evolutionary perspective is insignificant. A billion years is equal to 1,000 million years, and even a million years is incomprehensible. The geological evidence suggests that earth is roughly 4.5 billion years old, or 4,500 million years, or 58,227,848 human life spans. Just try to imagine that family tree. To put this into perspective, consider an analogy sited by professor of Psychology, William Von Hipple, in his book the Social Leap. If the entire existence of the Earth was a single year (one Earth Year), then life would not have appeared until June, creatures that possessed heads wold not have appeared until October, and humans would not have appeared until nearly the end of December 31st. These principles have helped me to conceptualize the process of evolution, as well as understand questions I have related to my own psychology, the social interactions I experience, and the biological world I see around me. While these principles demonstrate how we’re the result of 3 billion years of evolution that does not mean that we have no say in what this life should be to each of us. While I believe that evolution can explain love as a means of survival, let us not forget the good feelings we experience when we act upon it. Even if love is biological rather than spiritual, I say, let’s bask in the warmth of connections we experience with others and the natural world. A good life is dependent on both humanity and love. My aim is to produce evolution related topics that are of interest to you (see below for potential article topics) and to explain them via the the principles laid out above. If you have a question related to your life experiences and would like to explore it through the lens of evolution please let me know. You can find my contact info here, or connect with my personal account on Twitter — @explorer_poet. Evolution and Us publishes a periodic newsletter, which contains my latest posts, news from the world of evolutionary science, updates, and announcements. Even if it is not financial support, just knowing that you’re interested and that my audience is growing keeps me going. You can also respond to the newsletter with comment, questions, or request for future content. You can also share my content with others, who would find it interesting. Evolution and Us is on Twitter and Quora. If you’d like to visit the Evolution and Us social profiles, click or tap on the images below. Since this publication is built on the Medium platform, please follow Evolution and Us, clap for our posts, and highlight the sections that connect with you. Thanks! Below are some topics I’m considering for future articles. Please highlight any of them that you would like to read. I will focus on the ideas that get the most highlights. Or, if you have a topic you’d like me to write about, please add it to the comments below. Thanks!